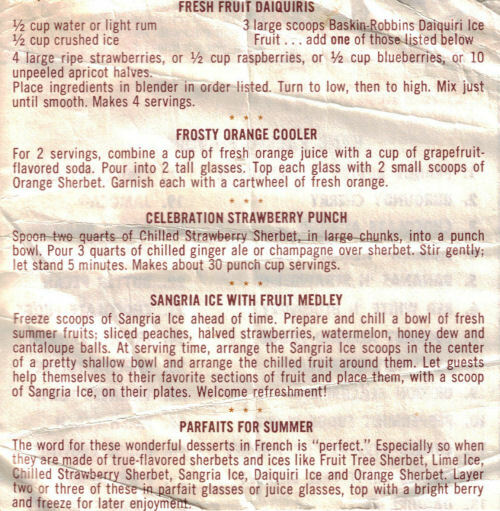 This list of recipes is listed on the back of a promo piece for Baskin-Robbins, the other side is their 31 Flavor List – August 1974. This was found in a large collection and I have the recipes typed below along with a scanned copy (recipe side only). 4 large ripe strawberries, or 1/2 cup raspberries, or 1/2 cup blueberries, or 10 unpeeled apricot halves. Place ingredients in blender in order listed. Turn to low, then to high. Mix just until smooth. Makes 4 servings. For 2 servings, combine a cup of fresh orange juice with a cup of grapefruit-flavored soda. Pour into 2 tall glasses. Top each glass with 2 small scoops of Orange Sherbet. Garnish each with a cartwheel of fresh orange. Spoon two quarts of Chilled Strawberry Sherbet, in large chunks, into a punch bowl. Pour 3 quarts of chilled ginger ale or champagne over sherbet. Stir gently; let stand 5 minutes. Makes about 30 punch cup servings. Freeze scoops of Sangria Ice ahead of time. Prepare and chill a bowl of fresh summer fruits; sliced peaches, halved strawberries, watermelon, honey dew and cantaloupe balls. At serving time, arrange the Sangria Ice scoops in the center of a pretty shallow bowl and arrange the chilled fruit around them. Let guests help themselves to their favorite sections of fruit and place them, with a scoop of Sangria Ice, on their plates. Welcome refreshment! The word for these wonderful desserts in French is “perfect.” Especially so when they are made of true-flavored sherbets and ices like Fruit Tree Sherbet, Lime Ice, Chilled Strawberry Sherbet, Sangria Ice, Daiquiri Ice and Orange Sherbet. Layer two or three of these in parfait glasses or juice glasses, top with a bright berry and freeze for later enjoyment.